Translated from the French language boutonniereIt means "a flower in his buttonhole." Traditionally it is considered masculine small bouquet or a single flower that matches the style and color of the bride's bouquet. 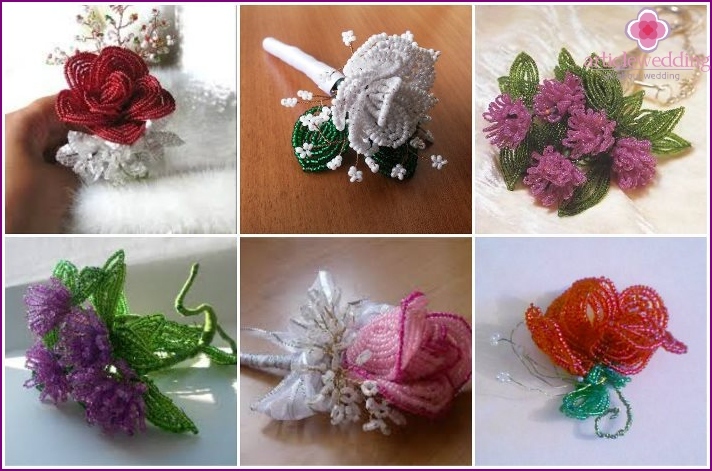 But now, boutonniere for the bride can look like a whole miniature floral composition with rose, orchid or peony, supplemented by various ornaments in the form of beads, mesh, berries, feathers. 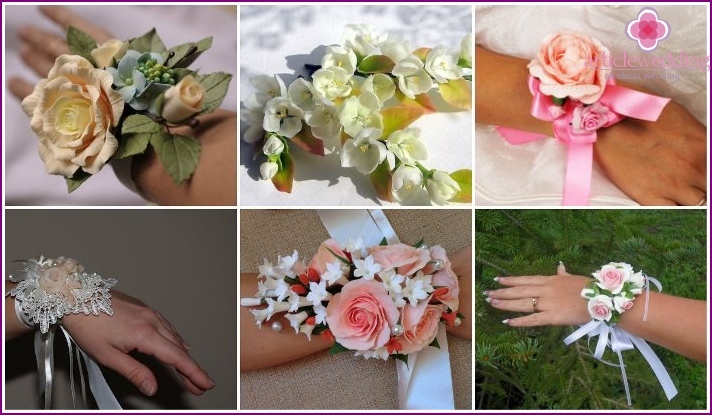 Modern girls do not lag behind fashion, and, if desired, also adorn themselves with a small bouquet, which is mounted on the wrist or on the dress. Some brides are wondering - if she needsboutonniere. The unequivocal answer is no. Every bride chooses itself, whether it fits a flower accessory. The composition of the bouquet and boutonniere should completely repeat each other. If the bride wants a wedding to look extravagant and stylish, be sure to include in the list of their ornaments boutonniere. In addition, after leaving her wedding to remember for many years it will be a part of good memories. When you plan to color wedding, floralbride composition, the witness and girlfriends have to be in the same style and the same colors. 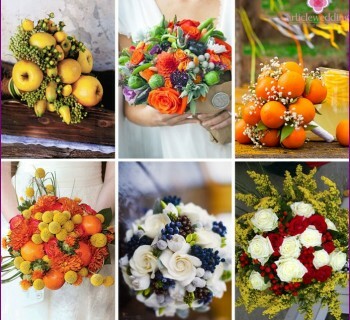 If the wedding is classic, the mini-bouquets palette solemn day culprits and guests may differ. But in any case, floral arrangement bride should look sleeker, more elegant than others. Perhaps the division into three categories: the most beautiful accessory the bride, a little more modest in the witness and girlfriends simpler boutonnieres. A small bouquet of the bride on his arm even replaceprecious metal jewelery. 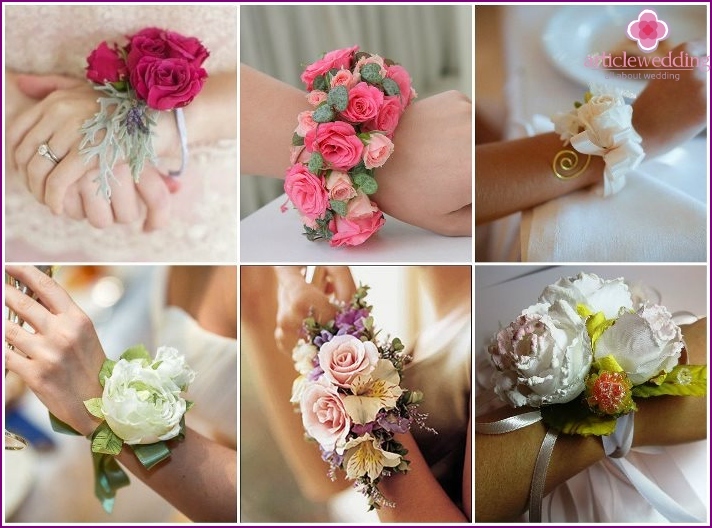 Nothing can give so much charm the bride as a miniature repetition of the bouquet on her wrist. Fantasy Bride and experience a florist at the general cooperation can create unique beauty of the decoration. Taking into account all the rules for creating buttonholes, the bride will look like a forest nymph on the day of their wedding. 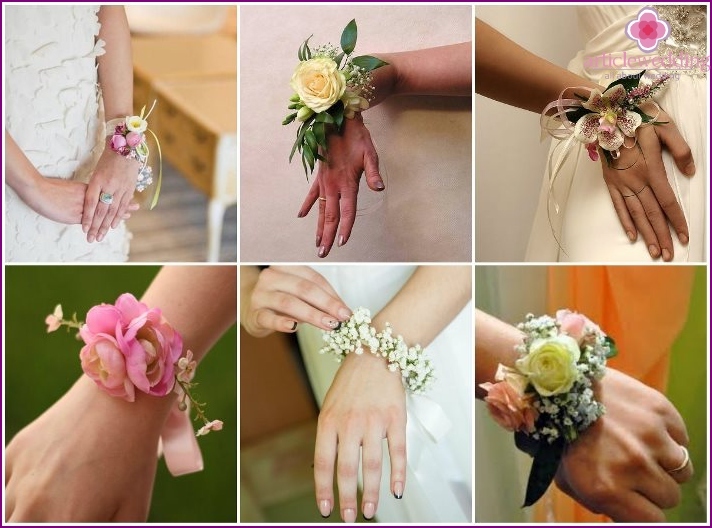 Bracelet with fresh flowers for the brideIt becomes a full-fledged alternative to flowers throughout the ceremonial part of the day. Putting on the wrist boutonniere, bride realizes that got a lot of indisputable advantages. Her hands are free for other accessories, such as a wedding or an umbrella clutch. It may receive gifts, dance, without worrying about where to place a bouquet. Fresh flowers in a bracelet, saturated with moisture and secured in a certain way will be long to keep its freshness and beauty. Progress wedding industry is not standing still. 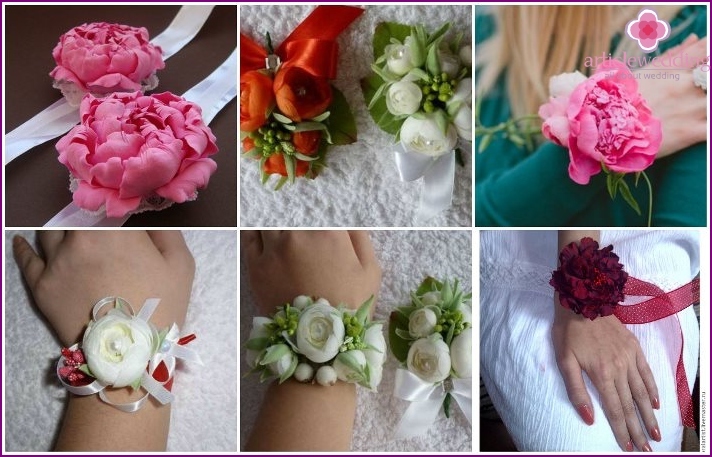 The proposed artificial flowers for boutonniere bride can also be amazingly beautiful. Repeating shades of color, shape and size of real flowers, they can become a worthy replacement. 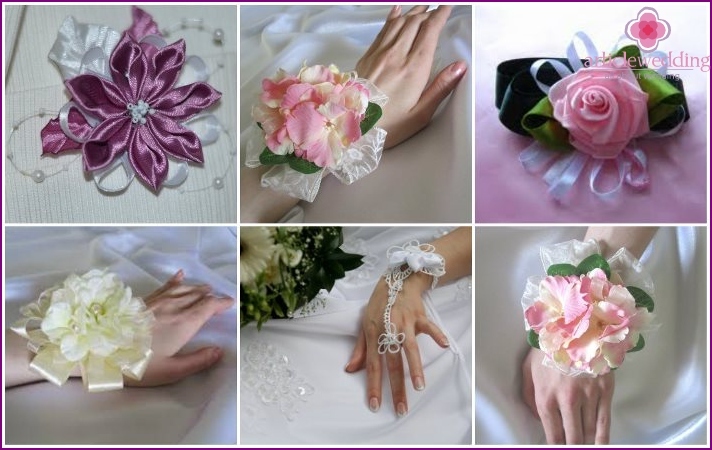 Fixed on a satin ribbon or decorated with gum, mini-bouquet will be an elegant decoration for a bride. The undeniable advantage of artificial flowers is that they do not need to monitor the freshness of a mini-bouquet. After the wedding ceremony, it can be kept as a family relic. Half a century ago, people did not know aboutthe existence of polymer clay. With the advent of self-hardening mass of creative people quickly found a use for. For the wedding theme that was as the main directions of work. 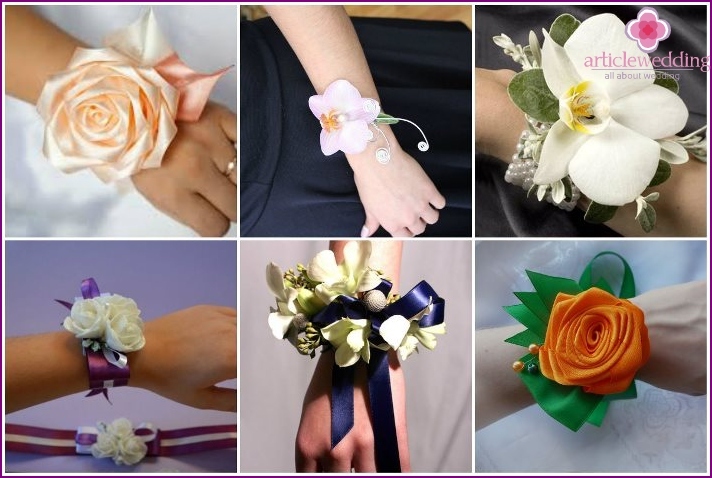 Stylish, unusual bouquets, flower barrettes, made using polymer clay is sometimes very difficult to distinguish from the source. Hard work allows artists to admire their work. Amazing rose, peony, delicate forget-me-or orchids, created with polymer clay, not leave others indifferent. 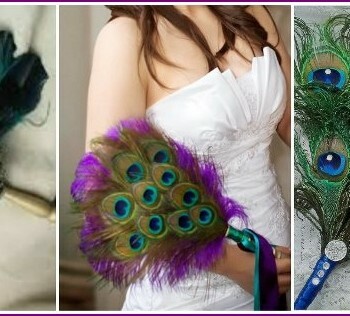 Buttonholes or beaded bouquets combinebeauty, versatility and a flight of fancy. After using the beads, you can create not only a rose or peony, but also strange delicate flowers, which do not exist in nature. Colours may be limited only by the choice of starting material. These bouquets are not fade, not osyplyutsya, and in the light of night lights will sparkle with new iridescent colors. A drop of your favorite perfume on the tape leaves a chicodor plume of beaded flowers, why complain that artificial flowers do not smell - there is no reason. The big advantage is the simplicity of storage and resistance to the whims of the weather. The weight of a small bead bouquet did not harder floral counterpart. Universal boutonniere is a clear reminder of the wedding day. Compact, original floral arrangement ina bouquet, is tailored to the tastes of the bride and privileges. It is the first on the right to vote is to choose your favorite colors, which will be included in the bouquet and boutonniere. Also, it may be symbolic plants, perhaps reminiscent of the first date, or the day when it was a question the fate of the compound. 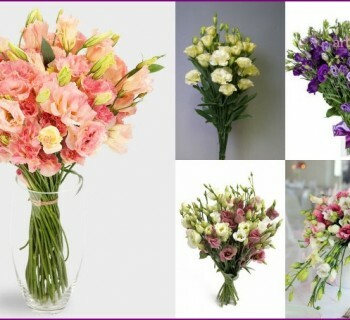 The most common variants-favorites are roses, peonies, calla lilies and orchids. For completeness inflorescence other compositions may be added to them. The final step in the transition became fashionable floristrythe use of a rosebud in a mini-bunches up the whole flower arrangement. To do this often use the buds bush small size rose, surrounded by fresh green sprigs. Colours can be bright, saturated or pastel shades. Classic bouquet with a rose suitable for any style of wedding dress the bride, making her image even softer and more attractive. Seasonal spring flower, could not be preciselyIt gives the mood of a wedding celebration. Peony is a symbol of love blossoming and fragrant, tender will complement the wedding dress of the bride. Blown peony bud, like a smaller copy of the skirt of the bride, will give even more charm culprit celebration. At least looks good boutonniere bud peony. A diverse palette of colors will help determine the choice. A wonderful choice for a refined wedding -boutonniere with orchids. This wonderful flower accentuate the stylishness, the luxury and elegance of the decoration of the bride. 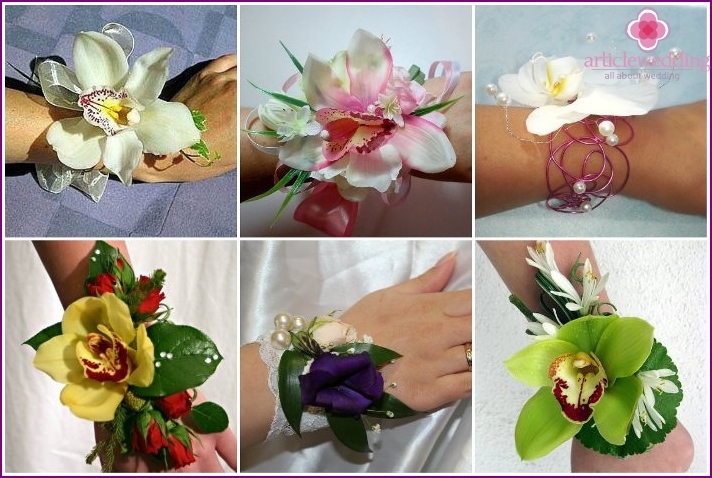 Orchid - flower-sufficient, so created a mono bouquet of only one cultivar, or decorate the bride's hand no worse than the complex floral arrangements. The stem is placed in a capsule with a special solution to prolong flower viability. Bright light or delicate orchid petals equally become a wonderful decoration, eye-catching. In recent years there has been a tendencythe return of interest in the products made by their own hands. Young people revive old traditions of needlework in various fields of creativity. Wedding fashion world is so expanded its borders, even for the most electoral Suite may find a suitable option. The widespread recognition among future spouses has found an independent production of mini-bouquets. For example, the proposed video futurethe bride and groom can share their own to make a flower arrangement for a bride. Based on this example, with a little hard work and imagination, you can make different kinds of ornaments with other colors on the wrist. It may be roses, peonies, which will be a worthy substitute for decoration bought. They will live on the memory of the warmth of the soul and prepare for the momentous day. Choosing a boutonniere in pre-wedding bustle importantdo not forget that it is in complete harmony with the rest of the bouquet and the bride's attire. Not so important, whether it is with live or artificial flowers, made with his own hands or purchased, the main thing that brings joy decoration. 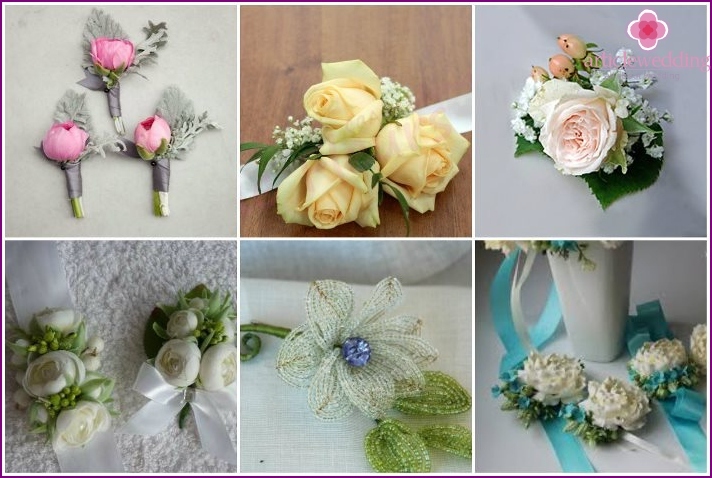 Wedding boutonniere carries a semantic meaning and will become a symbol of enduring love. Save memorable floral attributes, they become a talisman for a young family.